Bali Island is part of the Indonesian Archipelago and consists of eight regencies (kabupaten) and one city (kota) Denpasar, the island's capital city. The regencies and city are administrative, political and agricultural regions that have replaced Bali's earlier kingdoms. Our Tourist Guide to Bali is divided up by geographical areas: North, South, East, West, Central Mountains and Central Plains, as well as a section on the three islands off the south-eastern coast. Badung Regency is located in the centre of Bali island, extending from the central highlands, down through an isthmus to the Bukit Badung or Nusa Dua Peninsula, with its world-famous white beaches and rolling surf. Badung is bordered on the north by Buleleng Regency, on the west by Tabanan Regency, and on the east by Bangli and Gianyar Regencies and the Denpasar Municipal Area. It covers 418.52km2, and has a population of 543,681. It is divided into six districts (kecamatan), 40 administrative villages (desa dinas and kelurahan), and 117 traditional villages (desa adat). The villages are again subdivided into 297 smaller community groups known as "Dusun", and 498 "Banjar". On the map of Bali, the regency's shape resembles a keris - a distinctive Indonesian dagger. The keris has become a symbol of the regency, symbolising the area's history - in particular the events of Puputan Badung. This spirit is also reflected in the motto of Badung Regency: "Cura Darma Raksasa" (governmental obligation to protect the people and truth). Bangli is the only regency with no sea coast border. It is home, though, to the beautiful sights of Mount Batur and Lake Batur, set in the island's volcanic highlands, with their bubbling hot springs and lush rice-field-clad slopes. The Regency of Bangli covers about 520.81 km² and is administratively divided into four subdistricts and 65 villages, with a population of 215,404. Bangli's economy is based in the agricultural sector, with a small craft industry also supporting tourism.The volcanic mountains slope down to Tejakula in Buleleng and Tianyar, while the rice-growing areas overlook Klungkung and Gianyar Regencies. Situated along on the northern coast of Bali, Buleleng overlooks the Sea of Bali to the north, Karangasem to the east and the regencies of Jembrana, Tabanan and small areas of Badung and Bangli to the west and south. This historical kabupaten (regency) is somewhat isolated from the rest of Bali, and has developed distinct social and cultural features. The area attracts increasing numbers of tourists each year, with its breathtaking natural scenery and unique history. Buleleng is made up of nine subdistricts, with 146 villages/administrative villages and 163 traditional villages, all in an area of 1,365.88 km² and with a coastline of 144 km; its population 624,079. Located at the centre of Bali, Gianyar is the second most populous region of the island, with 470,380 people in 368 km2. It is at the cultural heart of the island; the highland town of Ubud, in particular, has gained a reputation as a centre of art and culture, with a number of foreign artists settling there in the 1920s, '30s and '50s. The regency's subdistricts are Payangan,Tegallalan,Tampak, Siring, Ubud, Gianyar, Sukawati and Blahbatuh. Gianyar is renowned as a tourist area, because of its beautiful views of mountains and stunning coastline. Many ancient objects are on display, and crafts and artwork of all kinds are produced by skilful and creative hands. There are also several popluar animal parks in the area. This regency is thought to have been established in the early 1400's. In the 17th century, sparsely populated Jembrana was not of much interest to the other royal Balinese kingdoms, and for a time it was ruled by a prince from Sulawesi. Jembrana was also among the first Balinesian kingdoms to surrender to the invading Dutch. Located in West Bali, Jembrana and consists of four subdistricts, divided into 51 villages/administrative villages (desa/kelurahan). It has an area of 841.8 km², with 261,618 inhabitants. The region's agricultural sector produces rice, water melon, vanilla, cloves, buffalo, oxen, chickens, fish and prawns. Its industries include fish canning, coconut coir, garments, weaving cagcag, bamboo matting, wood carving and others. During the 18th and 19th centuries, Karangasem was the most powerful kingdom in all of Bali - though in the middle of the 19th century, it was, for a time, a vassal of the neighboring island of Lombok. Covering 839.54 km², the district of Karangasem is well known for its breathtaking landscape, formed by lava flows from Gunung Agung, the sacred mountain of Bali. Beautiful terraced paddy fields lie on the lower south-eastern slopes; coffee and clove plantations are found higher up. The population is 396,893, spread over eight sub-districts and divided into 71 administrative villages. Klungkung, meaning "happiness" or "beauty", is Bali's smallest district, lying on the south-eastern coast and including the islands of Nusa Penida, Nusa Lembongan and Ceningan. The great Unda River flows through this district and passes through many beautiful villages. Semarapura, once called Klungkun Town, is a bustling commercial centre, home to the largest market in Bali. The regency's area is 315,0 km², and it is divided into four sub-districts - Banjarankan, Klunkung, Dawan and Nusa Penida - with a total population of 170,559. Adorned by mountains in the north, lush paddy fields in the south and coastal sandy beaches, Tabanan lies between the districts of Badung in the east, Buleleng in the north and Jembrana in the west. Tabanan's main attraction is Tanah Lot, unquestionably the most famous temple in Bali, set on a tiny island just off the south-west coast. Most beaches in this area are covered with black sands, remnants of a previous volcanic era. The regency's area is 839,30 km², with sub-districts Baturiti, Penebel, Pupuan, Marga, Selemadeg, Kerambitan, Tabanan, Kediri, Selemadeg Barat, Selamadeg Timur. These are divided into ten administrative villages, 103 villages, 663 sub-villages, 663 environments - home to 420,370 people. Denpasar – capital city of Bali. 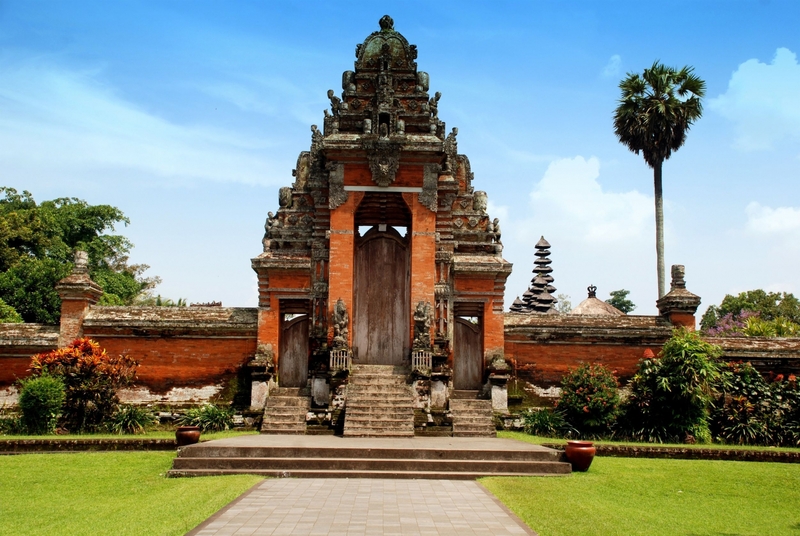 Denpasar is situated in south-central Bali, 70 km south of Singaraja. The largest city on the island of Bali, Denpasar was the site of a suicidal battle of the rajas of Badung against the Dutch Militia in 1906. A large square in the city centre, Puputan Square, commemorates the event. The population of approximately 788,445 is mostly Balinese, speaking a dialect of Indonesian, written in Pallava script. Most practise a form of Islam strongly influenced by Hindu customs, though there is also a Christian population. Arab and Indian merchants live here as well, dealing mainly in textiles - while Chinese run many local businesses. Industries include food processing, papermaking, printing, and the manufacture and repair of machinery. Handicrafts include sandstone carving, weaving, coconut and bone carving, plaiting, basket weaving, and the production of coir and of gold and silver jewellery. Denpasar is home to a branch of the National Archaeological Research Centre. The Bali Museum, built by the Dutch government in 1932, houses specimens of Balinese art from prehistoric times to the early 20th century. The Universitas Udayana is also situated within the city. Sites of interest include the Puri (temple) Pemecutan, St. Joseph Church, Meredith Memorial Library, Pasar Dadung market, Kokar (Conservatory of Performing Arts), Academy of Indonesian Dances, and the Abiankohas Art Centre. Summary of the 8 Regencies (kabupaten) and 1 city (kota).